Japan: Probe Of Battery Fire On Boeing 787 Finds Improper Wiring : The Two-Way Japan says an auxiliary battery was improperly connected to the main battery that overheated, forcing an emergency landing. 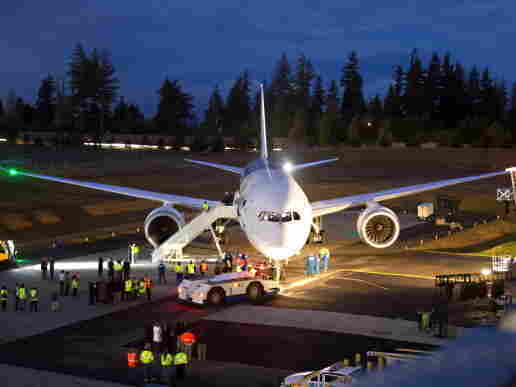 The first Boeing 787-881 Dreamliner delivered to All Nippon Airlines. In Japan, where a battery on an All Nippon Airlines 787 overheated and began smoking on Jan. 16, forcing the plane to make an emergency landing, the Transport Ministry released a report Wednesday saying it found that the battery in question had been improperly wired. The Associated Press, citing the Transport Ministry report, said the ANA 787's auxiliary power unit was incorrectly connected to the main battery that overheated. The incident prompted the U.S. Federal Aviation Administration and authorities in other countries to ground 787s worldwide. Flickering of the plane's tail and wing lights after it landed and the fact the main battery was switched off led the investigators to conclude there was an abnormal current traveling from the APU due to miswiring. However, the ministry said it still needed further investigation to determine exactly what caused the main battery to overheat. In another report, the Reuters news agency, citing an unnamed source said to be "familiar with [Boeing's] plans," said the aircraft maker had determined that the solution to the overheating problem was to increase the gaps between the battery's individual cells, but the report gave no other details. The Reuters story also quotes Kiyoshi Kanamura, a professor at Tokyo Metropolitan University, who has been involved in battery research, as saying that the "logical solution" for the battery problem is to install ceramic plates between the cells and add a vent to the battery box, presumably to dissipate the excess heat. The Dreamliner is a revolutionary airliner that is the first to make extensive use of lighter-weight lithium ion batteries, which are more prone to overheating and catching fire.